This app not game only Guide, tips andtrickRun Sausage Run! Get ready to play Motocross ATV bike Racing Stunts game, it is anamazing and thrilling game moreover the different environment madethis game more interesting and addictive. Other ATV bike game isall about the race and speed but this Motocross ATV bike RacingStunts game is different than other atv quad bikes game. In thisgame the different breathtaking stunts like fire stunts, difficultramps stunts, wood logs on road, boxes and rolling balls movingtowards your atv bike give you the realistic feeling. This gamewill improve your driving and stunts skills.Motocross ATV bikeRacing Stunts game having three different and amazing environmentslike snow, desert and grassy mode. Three amazing horse power ATVquad motor bike are provided to the racing and stunt lovers. Reachon time to the destination made you to make more score. You canunlock different heavy atv quads bikes by making more score, thesebikes having different speed and amazing smooth control. Become thebest ATV driver and the best stunt man on these difficultconditions.GAMEPLAY:Everything you have never seen in other atvquads bikes game is available for you in Motocross ATV bike RacingStunts game.This is an amazing game with different tricky snowiesttracks, desert roads and grassy modes to play with. Differentmissions are available you have to complete it very carefully anymistake will takes you to lose the game. Grip tightly whileperforming the dangerous stunts and avoid from the rolling ballsotherwise these balls will destroy your Quad Atv bike. differentdangerous hurdles like ramps, wood logs, boxes and container areready to check your driving skills. How good driver and stunt manyou are. Reaches towards your goal safe and on time helps you tomake more score. Improve your driving techniques and performthrilling stunts on dangerous hilly tracks.Motocross ATV bikeRacing Stunts Features:• Play as ATV bike rider and perform trickystunts • Three different ATV quad bikes to play with.• Be the beststunt man and atv quad bikes driver.• Three mind blowingenvironment, snow, Desert, and grassy.• Challenging missions withdangerous hurdles.• Realistic game with smooth controls.MotocrossATV bike Racing Stunts specially designed for all Moto ATV bikeriders fans and thrilling environment lovers. Enjoy the realisticatmosphere and smooth controls to play with, show what you reallyare and say shut up to your fear. Perform the dangerousbreathtaking stunts like the professional stunt bike rider and gothrough volcanic tracks, rolling balls, container and other hurdlesthat are ready to destroy you while playing this racing simulator. With this amazing quad bike repairing Be your ownmechanic!Motorcycles and Quad bikes, in general, are much simplermachines than their four-wheeled counterparts. In the Quad BikeRepairing Salon, you can learn all the important repairing andfixing tasks. Repair work on the vehicles are always a financialdecision not a leisure decision, therefore, doing work by yourselfis the best thing for a biker. The repairing work is not verycomplex it starts with Fault diagnosis and repair (mechanicalnoises, for instance), Electrical fault diagnosis/repair, Fuelsystem, carburetor fault diagnosis, and repair, music systemrepair, Engine and, or, gearbox replacement. Nearly every componentis just hanging out in the open, ripe for the picking. A simple setof metric wrenches and Allen keys will allow you to disassemblebasically the entire bike. Change the oil off the bike on time,replace the brake pads if they need to be replaced. Replace theworn out tires. In the Quad Bike Repairing Salon – Auto mechanicWorkshop you will learn to do all the basic repairing activities asa little garage mechanic. Doing your own bike maintenance is a loteasier than you think. The basic and most important repairing tasksinclude; setting tire pressure, changing spark plugs, Cleaning orreplacing air filters and fuel filters, Replacing light bulbs,Setting control lever positions, Oil and filter changing, Fittingnew brake pads (as applicable), Balance wheels after this makeensure to work these fixes which include; Replace chains andsprockets, and set wheel alignment, Fit fork seals, Replace/serviceheadstock bearings or swing arm bearings, Replace shocks, Fit newtires and turn the bike into new model. After completing the repairand fixing work paint the body of the bike and make it ready foruse. As a best and famous mechanic in the city, Fix your problemsnow. It’s very important to tune up your old, damaged bikes andbecome the best motorcycle mechanic. Start your auto mechanicalworkshop and offer complete bike repairing services to yourcustomers. Wash, fix, clean up and repair the motorcycle to enjoythe best opportunity to gain expertise as a garage mechanic in thisamazing Quad Bike Repairing Salon – Auto mechanic Workshop game. Pro ATV Bike Racing brings you the best motorcycle racingexperience in a free mobile game. Catch speed fever as you drivethrough 50 different tracks in 5 unique levels. With realisticphysics, 3D graphics, and 100 motorbike–rider combinations, theaction is endless and you are sure to have fast and furious fun.Race against friends and racers all around the world in MultiplayerMode, or improve your moto skills in Championship Mode. 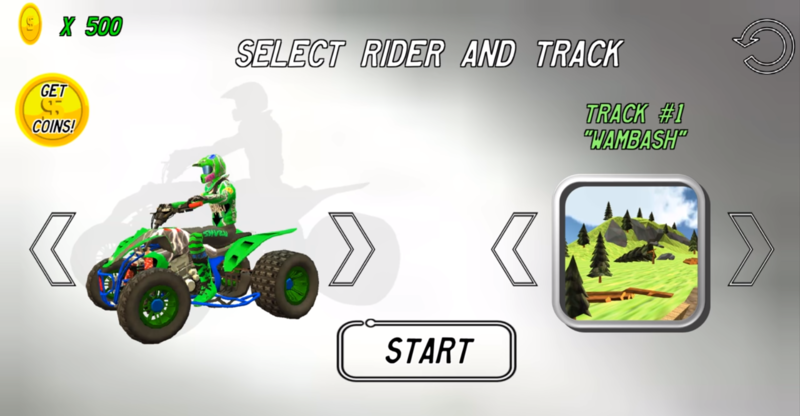 Features:★Amazing motocross racing action ★Hill climbs, jumps, and off-roadterrain ★Realistic ATV vehicles ★Intuitive touch controls★Addictive gameplay ★Awesome wheelies ★Flips and stunts ★Crazycrashes ★Online Player-vs-Player (pvp) ★Extreme air time★Challenging AI opponents ★Ultimate motorsports sound effects Enjoythe ride on 4-wheel bikes as you win races and earn coins. Use yourcash to unlock new racetracks, upgrade bikes, and buy new racinggear. Wind through the traffic of rival riders and beat thecompetition. Pull off tricks and flips to fill up your power band,then blast the turbo and wheelie across the finish line in firstplace. If you are a fan of motocross, supercross, bmx, or any kindof bike racing, then start your career now and own the roads in ProATV Bike Racing! EVEN BETTER THAN MONSTER TRUCK BUGGY BATTLESThis stunt mania arenawar beach buggy simulator is the most amazing V12 engine poweredracing game with the duel links against your arch enemies. 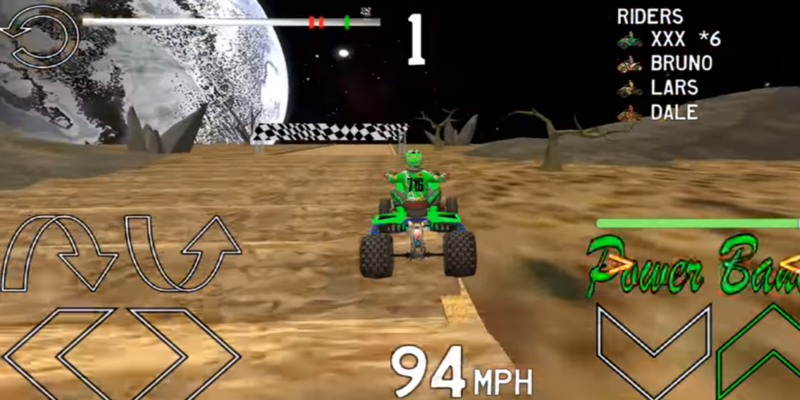 Stayahead of your opponents and crush them on your way to the finishline in the arena war beach buggy battle like no Monster Truck gameever! This stunt mania beach buggy stunting dome simulator is waybetter than any other racing game simulator out there and maybe youwill be the arena war champion!GO FULL THROTTLE THROUGH THESTUNTING DOMEPractise your majestic race cars parker skills in thisracing car driving simulator with many collision physics andgraphics. This fantastic beach buggy car driving practise game isfilled with collision avoiding levels and stunt mania missions. CANYOU COLLECT EVERY RACE CAR? !Do not cause any collision in thismajestic car parker sim or you will get penalties. Make your ownfate as you race along the edge of death in the great canyonstunting dome! Use all your precision driving skills to not cause acollision and show that you are the main car parker.Key Features:✔Make your own fate in the canyon racing circuit!✔ Any collisionwith the race cars parker will give you penalty points!✔ Can youcollect every army vehicle and police vehicle?✔ Conquer all themonster truck missions and earn new cars!✔ Become the Arena WarChampion when you complete all the levels!✔ More moto bike stuntracing and ships of battle simulator games coming soon! Little repairman! Get ready to repair, fix and build your quadbikewith best garage mechanic game. Do you like to play truck and carrepairman games? Let's try most awesome quad bike repair mechanicworkshop which gives you the amazing opportunity to be the carmechanic in your repairing saloon. In this repairing, fixing andwashing salon game you can experience the fun and adventure gameplay of cleaning and building a moto quad bike.Bikers! Quad bike isbroken from an accident occurred in the city traffic jam road andyou have to fix and build it in your auto garage like realrepairman. Take your vehicle car to service station where youperform different tasks like a crazy mechanic i.e. vehicle bodyrepairing, car paint shop, tire changing, car denting, light fixingand polishing thus making your quad bike brand new one afterwashing and cleaning it. Use your Fix It garage skills to performall tasks using different repairing tools and equipment. Show thebest quality work to your customers and prove your quad automechanic skills of motorbike fixing in this quad bike repairingsimulation game. This is also a mechanic training school where youlearn to fix sports cars, buses, taxi and other auto vehicles. Grabthe tools and equipment necessary for motorcycle fixing from yourcrazy garage and start repairing quad bike in workshop. Thisamazing quad bike repair mechanic Workshop provides you the bestopportunity to gain expertise as a garage mechanic in just onegame. Quad bike is messy and rusty first fix the car body bywelding the body and removing the dents. Quad bikes tires areflatted due to rusty road journey. Fix the tyres and make the quadbike ready. Messy and quadbike needs a complete spa salon andmakeover customizations. Clean up the bike like best cleaner andwasher. Quad bike is ready to be delivered to its owner.Littleservice station worker! keep on good mechanic work to gain morecustomers. Get ready for amazing ATV Quad Racing Moto Robot TransformationGame adventure, featuring beach atv quad bike robot in realisticcity rescue mission. In this robot transformation game, you willbattle as atv quad bike or moto robot along with destructive flyingbike with evil robots including flying robot mech machine &real robot X robot autobots along with flying motorbike indeadliest robot war. Save the innocent people of the crime city assuperhero robot using quick robot transform ability and futuristiclaser machine guns or highly destructive war machine weapons. InATV Quad Racing Moto Robot Transformation Game you will fight asvigilant bike robot or modern police bike along with futuristicrobot in deadliest robot battle arena against war robot or viciousmoto bike utilizing quad bike simulator or real physics basedmotorbike simulator along with atv simulator in epic war. ATV QuadRacing Moto Robot Transformation Game provides highly thrillingrobot fighting games based adventure in which you as beach atv quadbike robot or vigilant moto robot will battle for city rescuemission at various locations of the crime city or futuristic city.As robot superhero atv quad bike or eminent flying motorbike alongwith police bike you will face various rescue situations of epicwar or intense robot war in which you will have expertly utilizehighly destructive war machine weapons and futuristic laser machineguns to defeat vicious moto bike or deadly war robot in robotbattle arena. Do you like playing robot transformation games orhighly thrilling atv quad simulation games then you will find thisgame as per your satisfaction. In this robot battle game, you asflying bike or superhero robot will have move quickly to damagedlocations for saving innocent people of futuristic city againstreal robot X robot autobots & flying robot mech machine in wellspread robot war. Get engaged as futuristic robot or eminent robotsuperhero with evil robots in robot battle arena utilizingmotorbike simulator or real physics based quad bike simulator alongatv simulator rescue innocent people of the survival city.In ATVQuad Racing Moto Robot Transformation Game the futuristic cityrequires eminent beach atv quad bike robot or vigilant moto robotalong flying bike which can battle against flying robot mechmachine & real robot X robot autobots along with robotsuperhero in well spread city rescue mission of epic war. In thisrobot battle game, you will have find out your way out as atv quadbike or superhero robot police bike having exceptional robottransform ability or modern flying motorbike along with futuristicrobot to defeat evil robots including war robot with quad bikesimulator or real physics based motorbike simulator along with atvsimulator and stop well robot war Features:- Highly colorfulastonishing HD Graphics of beautiful futuristic city. - Top notchsound & effects from atv quad simulation games.- Beautifulvarious robot battle missions from engaging transforming robotgames.- Intuitive Controls for flying around futuristic city fromrobot transformation game- Simplified & addictive robotfighting game play mode. Welcome to the next transform evolution of city stunt racing withinstantly mix vehicles, transform from land, sea, air, platforms byflying airplane, racing cars, riding atv, floating powerboats andmore in modern city. Play Transform Race City: ATV, Cars, Aircraft& Boats the multi transformation racing game. More the 8transforming racing tracks from crazy vortex to aerial stunts, fromcity bike ride to impossible track car race it bring all in onecity transform race game. City car transform into flying airplaneor transform flying aircraft into speed boat the fun never ends.Flying car and robot transform is old now get ready for citytransform race game evolution over sea, land and air like neverbefore.City transform race game offer you the ultimate fun withcity car transform and atv transform racing events. Jump from NYcity downtown street into speeding jet above ocean, and dive fromflying airplane to water jet-ski. The surprise will never ends withthe real city transform race. Drive multiple transform vehicles bycrossing transformation checkpoint into another type vehicle. Morethan 6 multi transformation checkpoints to teleport from flying carto atv ride. Enjoy the transform evolution of city stunt race withcustom vehicles enable your flying pilot, car racer and ATV riderskills and more. Don’t get wrecked cross over neon mountain withfairway drive, switch up racing car and transform auto into jetboat over ocean waves. Get all futuristic transform racing car,flying plane, ATV rider thrill in one mega ramp race in multitransform race. If you love playing robot car transform or robottrain transform game, then jump from crazy mega ramp intooff-roads, cross land air to sea transformation race. Enjoy citycar transform race from mega ramp to flying airplane transformationwith nonstop fun. Play Transform Race City: ATV, Cars, Aircraft& Boats fill your need of speed with drifting and racing acrosswater, land and air. Forget transform robot battle and race intoamazing transform race of the year.Fall from sky mega ramp and citytransform airplane into powerboat to race over ocean beach. Playthe newest car transformation game with the twist of multipletransforming fun. Enter metro car transform race and switch tomulti transformations stunt game with mega ramps, each checkpointof transform race game will bring surprise for player. Flyairplane, face atv rider mission, mega ramp car jumps and waterpowerboat race and more in transform racing. The fun game neverends rank higher with high score like never before. Get cartransform race game with lots multi transformation challenges. Flyand race from land to air to sea with multi transform race gamewith mega ramps jumping. Exhibit ATV rider skills and motorbikeriding skills on impossible tracks race. Transform ATV rider toflying airplane pilot with mega ramp transformation checkpoint.Feature:More than 8 multi transformation raceRace over land, in skyand across oceanFly airplane, sail boat, race car and ride ATVmotorbikePlay transform race with lots of multitransformationSmooth controls for flying airplane and ATVriderRealistic jet-ski and motorcycle riding animationsDownloadTransform Race City: ATV, Cars, Aircraft & Boats the mostchallenging and fun game with multi transforming missions. No moreordinary robot transformation when you can face real time transformmissions.